Adam Corbett admits being handed the captain’s armband during Spartans’ match against new champions East Kilbride in midweek was the proudest moment of his career. 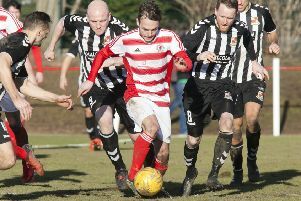 The Ainslie Park academy graduate has made a significant impact at the heart of the Capital club’s defence since stepping up from a successful under-20s side to Dougie Samuel’s first team last season. The 21-year-old centre-back has been a mainstay this term and his stand-out performances are sure to have alerted a number of SPFL clubs. Corbett’s rapid progression alongside fellow youngsters Jamie Dishington, Blair Atkinson and goalkeeper Blair Carswell has ensured the quartet have all become key members of Samuel’s squad. And he claims leading out the team during their 2-1 defeat on Tuesday night – which sealed the title for Kilby – in the absence of regular skipper Mikey Herd outlined Samuel’s faith in him to carry out the role. “It was a special night and a very proud moment for myself,” stated Corbett. “I didn’t know it was happening until the manager spoke to me in the changing room before kick-off. “Dougie told me he was going to change the personnel around a little bit, so a few boys dropped to the bench. We’ve still got some big games coming up, including a cup final, so I think he was trying to keep some fresh legs for those games. “The fact the role as captain carries a lot of responsibility was one of the things that was going through my head. It shows Dougie trusts me as a player both on and off the pitch, so that gave me a lot of confidence. 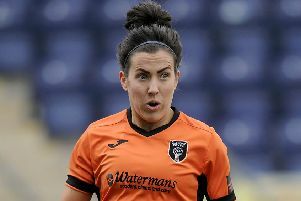 “The majority of the players have been in the team a lot longer than I have and I never thought I would’ve captained the first team, especially against East Kilbride in a game that meant quite a lot to both sides. “I thoroughly enjoyed the experience, even though we were unlucky with the result. A couple of mistakes cost us but I felt we played really well and there were far more positives than negatives to take from the game. Corbett reckons the strong defensive partnership he has formed with the likes of Blair Tolmie and Gary Cennerazzo has also aided his development. Ahead of tomorrow’s mini Edinburgh derby with high-flying neighbours Civil Service Strollers at Christie Gillies Park, he added: “Playing beside boys that have cut it professionally before is helping me improve as a player. “You’ve got Blair’s experience across a number of clubs and Gary who has played in Sweden, Czech Republic and America. “They do everything they can to help me out, which makes my job a bit easier. We kept a lot of important clean sheets as a result last season. Elsewhere this weekend, basement battlers Whitehill Welfare must beat East Stirlingshire at Ferguson Park and hope second-bottom Dalbeattie Star lose against Stirling Uni in order to stave off the threat of relegation for another week. Edinburgh University entertain Gretna 2008 at East Peffermill.